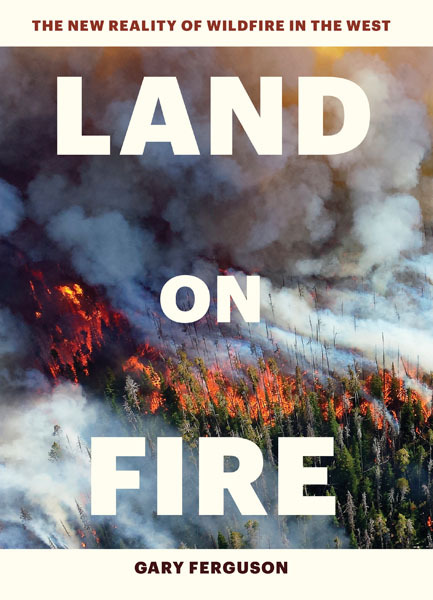 This article is based on Gary Ferguson’s new book, Land on Fire, the New Reality of Fire in the West, published by Timber Press, an imprint of Workman Publishing. About 30 years ago, when I first started roaming the wilds of Montana, I glimpsed the dramatic influence of wildfire on the state’s landscapes: how it determined what trees I was seeing in the forests—affecting even the shapes of the trees, as well as how they were spaced. How it drove the comings and goings of the grasses and the birds and the insects. And too, that wildfire was a kind of healing agent—clearing fallen timber and debris from the forest floor, checking the spread of disease and tree-boring insects. And finally, in this arid state, where decomposers are few, fire revealed itself as the primary means by which essential nutrients held in the timber were ultimately returned to the soil. While all this is still true, the fact is the nature of wildfires is changing. They’re burning hotter, faster, and bigger than ever before. Given this dangerous development, it’s a good time to take a closer look at our communities and the landscapes we treasure against this new reality—to get a better sense of where we are, how we got here, and some of what we’ll need to know to live well with wildfire in the years to come. Since 2000, in the West there have been an astonishing 10 fire seasons with over a dozen mega-fires, which are loosely defined as individual burns of more than 100,000 acres. Roughly 90% of the lands burned in the West in a given year are from less than 3% of the fires. Since 2000, the Forest Service has routinely drained its wildfire suppression budget—part of a federal effort that in many years tops $3 billion a year. Understandably, most of that money is being spent fighting fire in the so-called wildland-urban interface, or WUI, which can be thought of as any area where human structures come up against runs of natural vegetation. Roughly 200 million acres of the WUI— an area roughly twice the size of California—has been deemed to be at high risk of wildfire. of these lands are yet to be developed. and arguably, guaranteed its continued existence—by taking on the job of fire suppression in the West. They were awfully good at it. Maybe too good. Without natural stand maintenance fires, the fuel load on the forest floor steadily increased. Although we changed our land management practices decades ago, allowing lightning-caused fires to burn when and where appropriate, today there are still about 300 million acres in the West with unnaturally heavy fuel loads. To make matters worse, those heavy fuel loads are now coming smack up against climate change. The most comprehensive research to date concludes that since 1985 human-caused climate change has doubled the number of acres burning annually in the West. Rising temperatures and lower snowfall means snow packs are going off earlier and coming around again later in the fall. Since 1972, the fire season in Montana has lengthened by a whopping 75 days. And then there’s drought. Even if drought doesn’t kill trees outright it often leaves them weak, far less able to fend off pests like pine bark beetles. In California alone, 2016 saw the death of 60 million trees. Much can be done to make human communities less prone to going up in smoke in the face of wildfire. Thinning the forest around subdivisions, creating a five-foot apron of non-flammable material around homes, cleaning gutters and covering attics and crawlspace vents with screens, cutting lower branches from nearby conifers to deny fire a “ladder” for climbing up tree—all this and other simple steps can make a dramatic difference. Lest you doubt this, consider that during Colorado’s devastating Black Forest Fire in 2013, one subdivision that had done nothing to diminish wildfire risk lost 61 out of 67 homes; next door in the Cathedral Pines subdivision, which had made fire-oriented master planning and prevention a priority, only four homes were lost. And yet at this point only about 3% of the 70,000 communities in the wildland-urban interface have taken such steps. • Using open space and recreational trails as natural fire breaks. Should county governments fail to enact such rules, it’s increasingly likely that taxpayers elsewhere in the country will start pushing to make local counties responsible for a larger share of wildfire suppression costs. That’s a sobering thought, considering that in just two weeks of a major fire the Forest Service alone can spend over $200 million. It’s time to start taking climate change seriously: fully embracing alternative energy; phasing out the refrigerants that are especially damaging to the atmosphere (as 197 countries agreed to do in 2016); planting trees and supporting regenerative agriculture, the latter which helps sequesters carbon by leaving cover crops in the ground. We’ll also need to provide funding for thinning and prescribed burning—two strategic forest “treatments” that, when used appropriately, can help create healthier, less flammable landscapes. Those of us who choose to keep living in Montana, with its big skies and bright mountains and hushed forests, will increasingly find ourselves needing to make some measure of peace with this new world of wildfire. I have my fingers crossed that things will change for the better, that one day we might get ahead of the massive fuel loads we’ve created, as well as finally find the courage to do what’s necessary to ease this rapidly warming climate. But for now and for a great many decades to come, the lives of Montanans will unfold in the midst of a beautiful, yet increasingly daunting landscape. A turbulent, and often overwhelming land of fire. This video is a compilation of pictures showing the devastation caused by this fire. Many have lost their homes, their livestocks and their livelihoods. We have received very little media coverage so we need to spread the word and get our communities some help!